What Day Of The Week Is December 5? 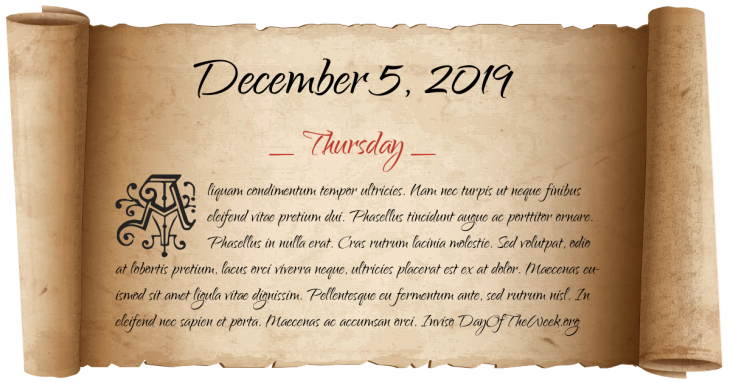 December 5, 2019 is the 339th day of the year 2019 in the Gregorian calendar. There are 26 days remaining until the end of the year. The day of the week is Thursday. Fourth Council of Toledo takes place. Chincha Islands War: Peru allies with Chile against Spain. Prohibition in the United States ends: Utah becomes the 36th U.S. state to ratify the Twenty-first Amendment to the United States Constitution, thus establishing the required 75% of states needed to enact the amendment (this overturned the 18th Amendment which had made the manufacture, sale, or transportation of alcohol illegal in the United States). The Soviet Union adopts a new constitution and the Kirghiz Soviet Socialist Republic is established as a full Union Republic of the USSR. Flight 19 is lost in the Bermuda Triangle. Sukarno expels all Dutch people from Indonesia. The Sri Lankan government announces the conquest of Tamil stronghold of Jaffna. Westroads Mall massacre: A gunman opens fire with a semi-automatic rifle at an Omaha, Nebraska mall, killing eight people before taking his own life. Who were born on December 5?